Every time when I go to an Italian restaurant, almost without fail I will order Caprese salad, or known as insalata Caprese in Italian. Caprese salad is probably one of the most beautiful and simplest salad. The 3 main ingredients for this salad are mozzarella, tomato and basil. 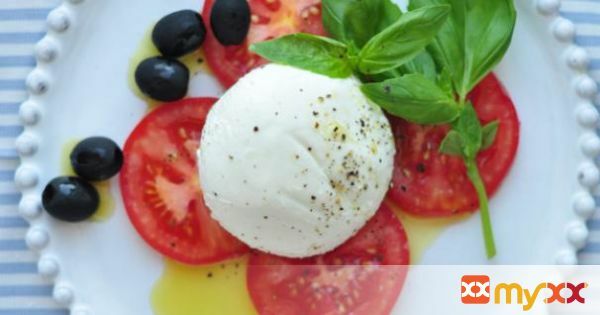 The colours of this dish are basically the colours of the Italian flag – green, white and red.Buffalo mozzarella is an Italian cheese that is made from water buffalo milk. The texture is semi-soft and it has high moisture content. According to Wikipedia: Mozzarella is traditionally produced solely from the milk of the domestic water buffalo. A whey starter is added from the previous batch that contains thermophilic bacteria, and the milk is left to ripen so the bacteria can multiply. Then, rennet is added to coagulate the milk. After coagulation, the curd is cut to large, 1″-2″ pieces, and left to sit so the curds firm up in a process known as healing. After the curd heals, it is further cut to 3/8″ -1/2″ large pieces. The curds are stirred and heated to separate the curds from the whey. The whey is then drained from the curds and the curds are placed in a hoop to form a solid mass.The curd mass is left until the pH is at around 5.2-5.5, which is the point when the cheese can be stretched. The cheese is then stretched and kneaded to produce a delicate consistency—this process is generally known as pasta filata.It is very important to use the best mozzarella and tomato you could get. Normally, the mozzarella is sliced into pieces, so as the tomato and then arrange on a plate by alternating them. The basil leave is tucked in each layer. For a change, I have decided to serve the mozzarella as a whole and place it in the centre, as if it’s the star of the dish! Now, the dressing is just extra virgin olive oil. So, get the best quality too! As we are heading into autumn soon, the day will get shorter and weather will get slightly more chilly. I just want to grab every chance I could to enjoy this sort of late summer meal – refreshing and simple salad. 1. Arrange the sliced tomato on each individual plate. 2. Place the whole mozzarella in the middle. 3. Divide the basil leaves and pitted black olives among all plates. 4. Drizzle the extra virgin over and season with black pepper and sea salt.